Welcome to Techie Tuesday(TT). Out of your Monday Blues..hah.!!?? 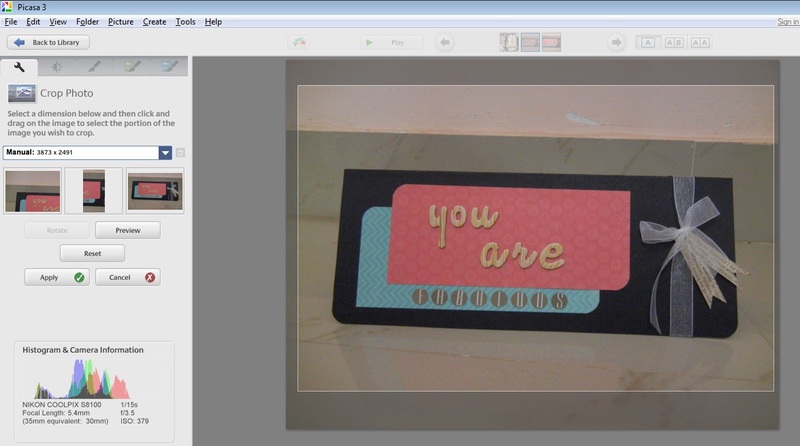 Today we will see a small tutorial on BASIC Photo Editing in PICASA3 software. Why are you doing this Techie Tuesday thing..?? 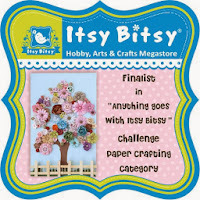 I am just giving back to the web/fellow crafters/bloggers who helped and inspired me a lot. WHY do I need the above tutorial..?? 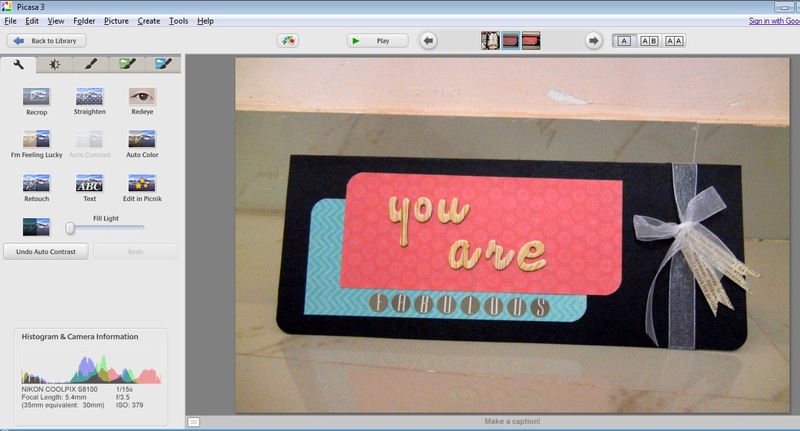 A crafter's/artist's work is shared mostly through photos. So i believe its very important to do some post processing on the photos before you show them to the world. Pictures do SPEAK a lot for YOU. Am I right..?? 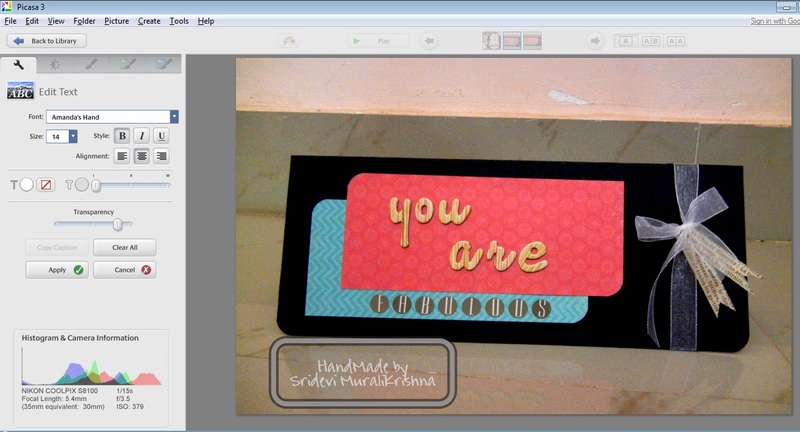 Open the pic in Picasa Editor.This is how it looks. I do cropping as the first thing so as to FOCUS my subject/project and remove any unwanted space around it. Goto LeftMenu -> 1st tab(Basic Fixes) -> Choose CROP. 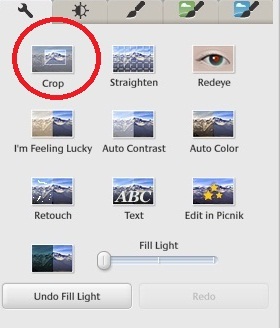 I generally choose manual cropping, you many choose default dimensions provided in the drop-down. By the way you can create your own aspect ratios too..!! if your picture is too dark.You can slide it up and down to lighten your photo.Am not using on this sample as it is not needed..!! I always feel that here lies the MAGIC..!! below is the picture after performing "AUTO CONTRAST "
Am a happy girl after this....he hee..totally..!! As I already mentioned, you may use "Fill Light" slider of this Tab if your picture is too dark and you want to fill some light in it. The "Highlights" slider makes the light colors on your image lighter and more obvious. Use it when you want the light parts in your photo to stand out. 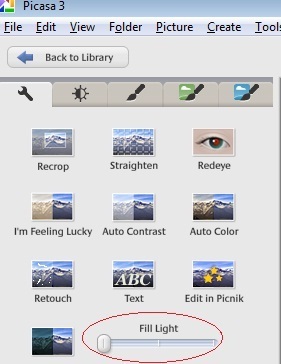 You can UNDO any edit you made on the image. 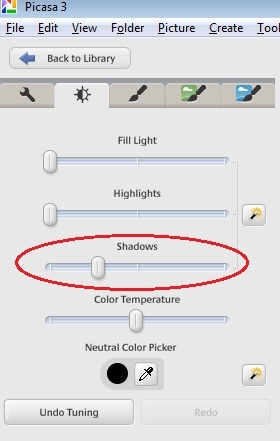 I am using "Shadows" slider. 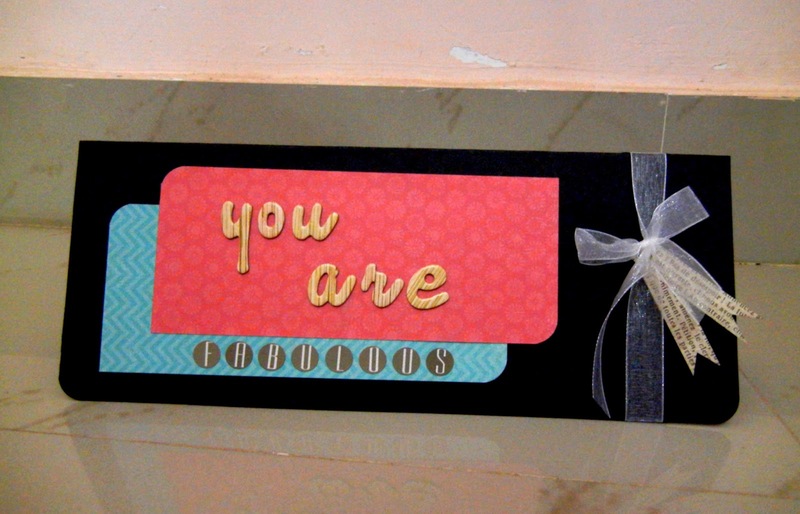 As the name indicates it can be used to highlight shadows of your image. 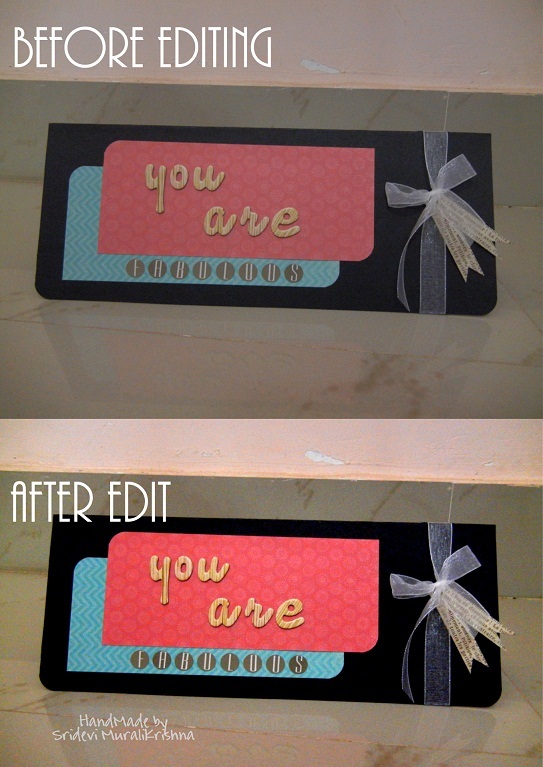 You can see in the below picture how the shadows have enhanced giving more bolder look to the card. Almost Done..!!?? Oh yes.. we will wrap up by a text/watermark to our image. 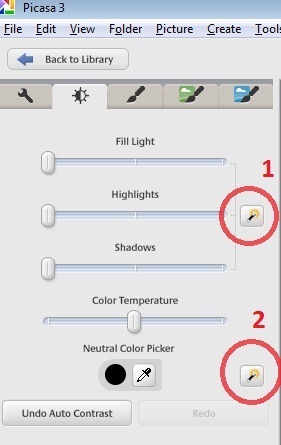 We will go back to the first tab, the basic fixes tab and choose "TEXT"
Image below shows the color picker. Choose your favorite color. Font,Size,Style of the text can also be changed. Use "Transparency" slider to give lighter/watermark look for your text. 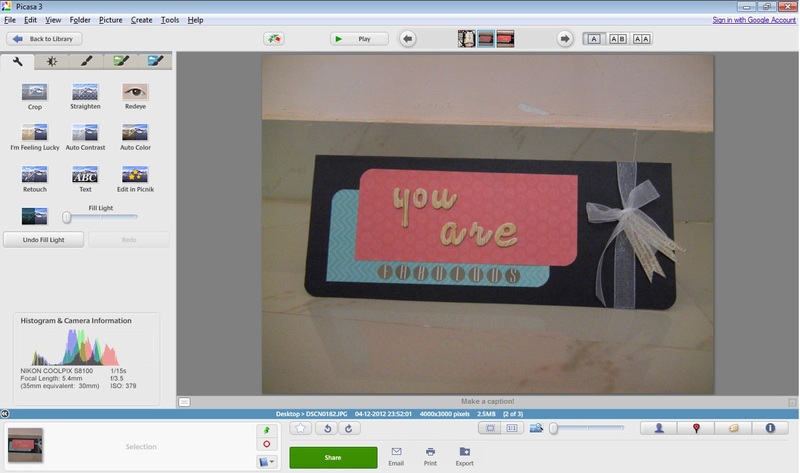 How did you like the tutorial and the Techie-Thursday(TT) Idea..?? Let me know if u have any suggestions/ideas/questions. You can comment below or drop an email @ sridevimuralikrishna[at]gmail[dot]com. Please share with your friends/fellow crafters/bloggers if you find the article useful. TechieTeusday(TT) is basically intended to share the TECH knowledge which I acquired while craft-blogging. Posts will be on photo-editing, blogging, blogger features, Gmail and more. As of now, Techie-Thursday posts will be out on every alternative teusday. You can see all the Techie-Tuesday posts here. Thanks Sridevi for TT. I find it very useful as I am new..Not yet tried the watermark for my photos.. Thanks for guiding me.. 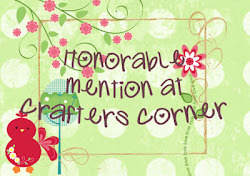 I have an award for you. Visit my blog and receive it. Do leave a comment.